There is an E flag for Australia. It is made of the shield of Australia (6 quarters, 1 for each state, surrounded by an ermine border) the whole thing overlaid with a gold seven-pointed star, a blue disk, a gold circle of roses (I think they're roses), and a crowned E.
This is the personal standard of the current Queen of Australia, used only within Australia, and only when she's personally present. The Queen of the UK leaves her personal standard behind - no England, Scotland or Ireland appear on the Australian E flag. Because there is no constitutional position for any other members of the (UK) royal family in Australia, they have no personal standards for use here. I seem to remember seeing Andrew use his UK one here when he visited my campus. In fact the star in the centre is shaded, in yellow (the same shade as Western Australia) and orange, with the light source coming from the top-fly. I'd guess it's a border of width 2 around a perfectly normal 18:27 (=2:3) banner of the arms of Australia. Changes were made by Graham Bartram to the various Royal Standards through BR20 [gra00], as reported in Flagmaster [fLm]. Aside from the artistic rendition of the badges in the quartering he has made three changes - standardising the flag proportions to the navy's 1:2, introducing shading to the Commonwealth Star and reversing the direction of the Western Australian swan. These changes were made without reference to and without informing the Australian Government. The change of proportions and the shading appear to have been accepted, however my information is that the actual flags used by the Queen in her recent Australian tour continued to show the swan facing the fly. The reason for this is that notwithstanding the change to the Western Australia flag badge, the Australian Coat of Arms has not been altered and since the Queen's flag is a defaced banner of the arms, the swan should not be changed. the Commonwealth Star is smaller, and does not extend beyond the Victoria/Western Australia panel. I noticed the crowns that appear are that of St Edward, the current crown style used by the Queen. Even though the flags of Queensland and Victoria have the St Edward Crown, the Australian Coat of Arms has not changed and still has the Imperial Crown. So does that mean that the crowns in the Queen's flag should be Imperial except for the crown appearing above the E? I know that British symbols were altered with the accession of HM The Queen in 1952, but I sm not sure whether this should have applied to Australia as well? Since it was designed/introduced in 1962 the Royal Standard for Australia naturally uses the St Edward's Crown, but should that on the arms of 1912 actually have been altered also? Does it not depend upon whether the blazon of 1912 actually called for an "Imperial Crown", and/or a decision/lack of decision by the Government of Australia? I am curious as to why Queensland's star is not a lighter shade of blue as in her state flag but David Prothero's suggestion that this is presumably because the star on the arms, dating from 1909, is dark blue, may just hold water. Another point of interest is why the Tasmanian Lion is so different from the version used on the State flag. The normal Australian Royal Cypher, was designed in 1962, for use on the Queen Elizabeth's Personal Standard in Australia and was adopted on 20 September 1962. As well as incorporating the Federation Star into the design, what is particularly interesting is the incorporation of the native Australian Wattle flower and leaves, with the English Rose flower, into the Chaplet or Garland, surrounding the monarch's letter "E" and St. Edward's Crown. Please refer to the attached section enlargement image, showing the Wattle's placement. 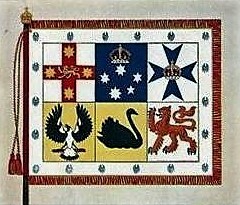 Unfortunately, none of the official descriptions of this Personal Standard mentions the Wattle in the Chaplet, but it was included in the original College of Arms - London drawing, and appeared subsequently in Britain's "Flags of All Nations" album - BR-20, and official Australian government publications, although not always clearly. Queen Elizabeth II's Personal Australian Standard, has its origins in the "Standard of the Commonwealth of Australia" carried in the Queen's Coronation Procession in central London, on 2 June 1953. This illustration of this Standard is published in "The Illustrated London News" - 6 June 1953, p.11. A number of then other British Dominions also carried such Standards in Coronation Procession. 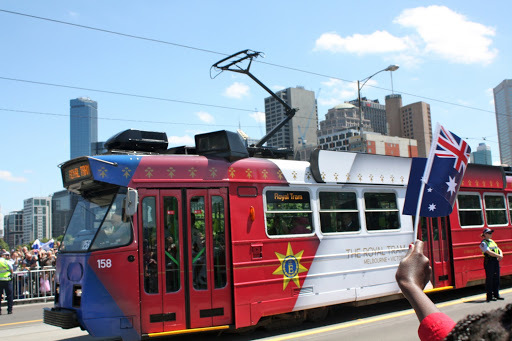 This specially painted Tram was used on the 26 October 2011, to carry Queen Elizabeth II and her husband, Prince Phillip, Duke of Edinburgh, the short distance from Federation Square, central Melbourne, south along St. Kilda Road to the beginning of Government House Drive. More information about this Royal Tram ride can be found at; http://www.yarratrams.com.au/media-centre/news/articles/2011/royal-tram-now-in-public-service/. The photo was taken by a visiting American couple, Zack & Aubree Keys. The Royal Couple were visiting Melbourne as part of a larger Royal Tour of parts of south-east Australia and Perth, Western Australia, where she opened the Commonwealth Heads of Government Meeting (CHOGM). Recently I re-discovered a photo in my archives of an earlier Australian celebratory flag for Queen Elizabeth II's Silver Jubilee in 1977. 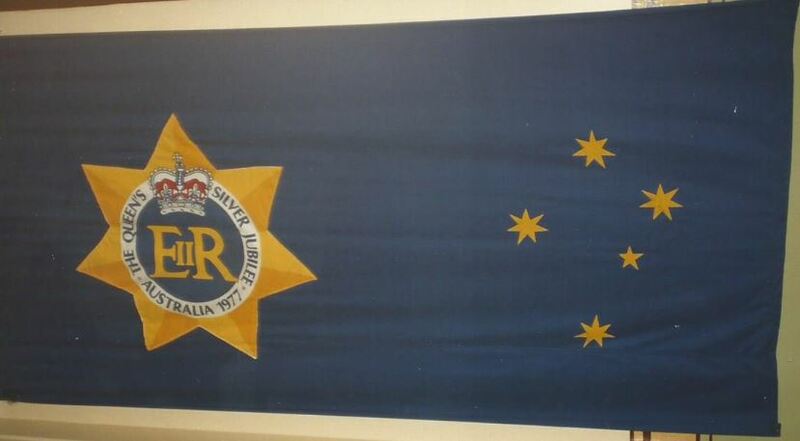 The attached flag photo shows a commemorative Royal Cypher all within a golden-yellow Australian Federation Star in the hoist, with a reduced size golden-yellow Southern Cross in the fly, all on a royal blue field flag.